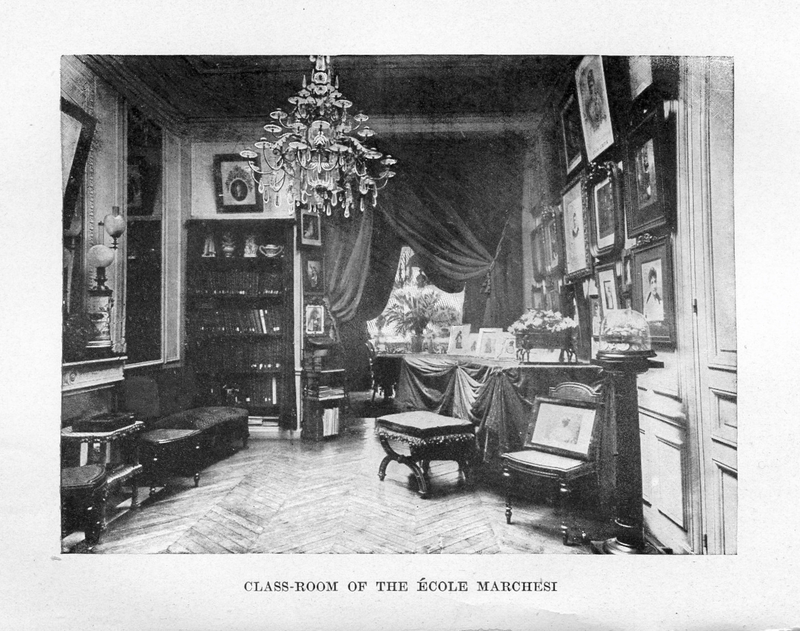 Mathilde Marchesi taught in a class environment in her vaunted Parisian studio; each student singing for fifteen minutes during a three hour class that met twice a week. The tuition was steep and paid years in advance. If you dropped out, that was it. You didn't receive a refund. Tough, thorough and severe, Marchesi cranked out dozens of famous singers, the evidence of which I have seen with my own eyes at New York Public Library at Lincoln Center. There is an amazing Marchesi Archive there—a fascinating collection, which includes a list of fifty famous singers who celebrated the 50th anniversary of Marchesi's studio. Her method—if you can call it that—was the complete opposite of what is encountered today. Marchesi, like her own teacher, Manuel García, kept students on a strict diet of vocal exercises and scales for at least a year. Think about it. Who does that today? No-one that I can think of. And as much as I know about this old school approach, I confess to not doing it either—not in the strict sense anyway. Why? Students simply do not have the wherewithal to conduct themselves in such a manner. We live in a very different time, one where the words discipline and sacrifice don't mean as much. What do I do instead? Three-fourths of the lesson is spent on technique, which is then applied to repertoire. This can be a two-edged sword depending on expectations, especially for the new student who arrives believing all he needs is a touching up, dusting off—just a little tweak if you please—but in reality does not have the skill necessary to sing at a professional level. (In Marchesi's day they called this "finishing," which recalls the last polish given to fine piece of furniture.) This kind of student more-often-than-not has an inflated view of his ability. And you can't tell him otherwise. Getting him to pay attention to what is coming out of his mouth is like asking him to climb mount Everest. It's just too much work. The ego bars the way forward. And therein lies the genius of Marchesi: It was impossible to hide in her class environment. You couldn't fool yourself. There were at least five to seven other "ears" paying attention. It also kept Marchesi on her game. Hello Daniel James Shigo ,Thank You for this post ,in fact for any post ,but especially those concerning Mathilde Marchesi.I have always been fascinated by her.I already read elsewhere that there is a list of fifty famous singers who celebrated the 50th anniversary of Marchesi's studio.I am so curious who is on that list and it occured to me that you might have it and would be willing to share it ?